When Woods finished, he stood at 5 under through three rounds, the leader in the clubhouse. By the end of the day, Woods sat in sixth, four shots back of Jordan Spieth and Xander Schauffele. 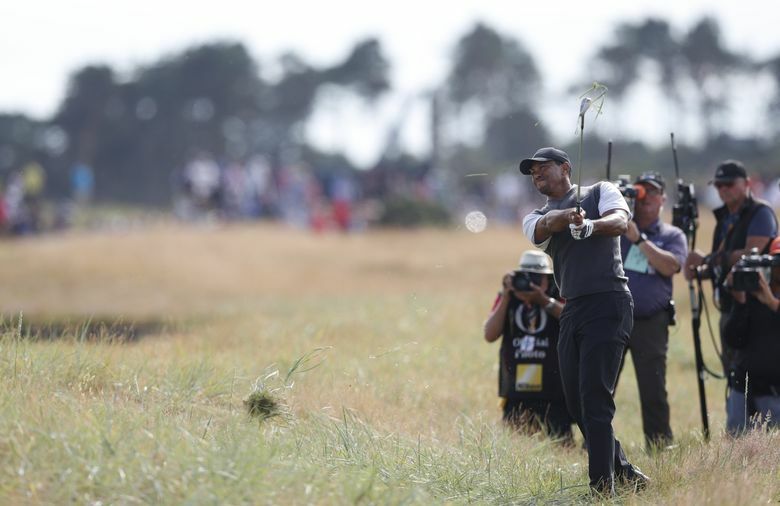 CARNOUSTIE, Scotland — The idea of Tiger Woods as a major-tournament threat, which flickered all along in golf imaginations even as it also spent much of this decade in a dormancy, returned fiercely on Saturday when Woods’s name appeared atop the British Open leaderboard. He had spent a third round in placid conditions by the North Sea making a steep, brisk climb. By then, it looked like the big thing was just bragging. Only at the par-3 16th hole, when Woods’s fine tee shot met with some unsentimental luck and rolled unkindly over to the right and off the green, did he find his first bogey. “I really didn’t hit a bad shot until 18,” said Woods, who got repayment from luck with his drive on the last, which landed upon the top of the stone embankment of the notorious Barry Burn, then remained dry even as it settled in the unfriendly foliage waterside. From there, standing beside the burn, Woods played conservatively to the proper path, then chipped gorgeously over another portion of the winding burn and within saving distance of the hole, closing with a fine par save. “That was big for me, just to not finish on two bogeys in the last three holes, [after] playing as well as I did,” he said. When Woods finished, he stood at 5 under through three rounds, the leader in the clubhouse and two shots behind the in-progress scores set by the rising Americans Xander Schauffele and Kevin Kisner, and one shot behind a cluster that included Spieth and kept changing shape and size. Many contenders remained on their front nines, suggesting Woods’s position might drop further given the untroubled air. As he finished and walked off the green at No. 18, playing his third major this season after missing eight in a row, the man who has won 14 major titles but none since 2008 looked absolutely younger than his 42. With him, the imaginations went off on a run, as when one reporter asked what a 15th major title might mean given all the strain and hubbub and surgery since the 14th, which was the 2008 U.S. Open at Torrey Pines in San Diego.